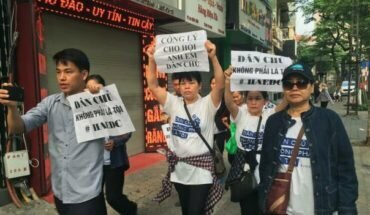 The protestors were supporting Hang’s daughter Dang Thi Quynh Anh [Đặng Thị Quỳnh Anh], who called on people to rally for her mother’s justice and right to access family members during detention. The Sunday protest involved bloggers in Hanoi and some Hmong people who appeared to be in Hanoi on land grievances. It was soon cracked down with hundreds of police troops deployed to the Hoan Kiem lake area, vastly outnumbering the marchers. Many protestors were taken to police stations. Tran Thi Nga [Trần Thị Nga], a blogger who writes under the name Thuy Nga, was contemporarily detained with her baby son. Nga said police had assaulted her and forcibly taken her fingerprints. She also accused some plainsclothed police of beating up Hmong people and insulting their ethnicity. Witnesses said that local authorities – the Hanoi public security and police forces – had tried to smash the protest. Hang’s daughter Quynh Anh was summoned by police demanding her to to be at the station “at exactly 8.30am” the morning of the protest, without specifying the reason. The night before, police had surrounded the Thai Ha Catholic Church in Hanoi that was launching a praying ceremony for Bui Thi Minh Hang. Many attendants including bloggers and activists said they were closely followed by plainsclothes police. 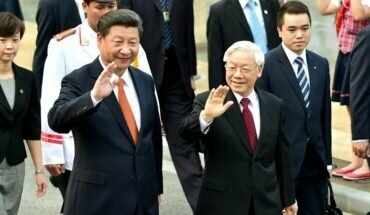 Protest rallies had been very rare in communist Vietnam until 2007 when bloggers in Hanoi and Ho Chi Minh City were involved in spontaneous anti-China demonstrations related to territorial disputes between the two countries. The protest on March 23, however, was among the even rarer rallies in support of a human rights defender.